Project: Provided editorial research for comprehensive biographical liner notes for highly respected reissue record company’s CD packages. Worked with multiple authors, fact checking and suggesting and performing re-writes. Detail: David Nathan. 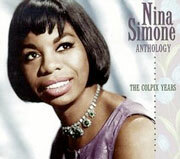 NINA SIMONE ANTHOLOGY: The Colpix Years. Edited by Melissa Totten. Los Angeles: Rhino Entertainment Company, 1996.